Imagine what it would be like to sail the waters of the world in your own STARPATH 44. There are accommodations for eight in three-cabin privacy, plus the luxury of a separate aft cabin especially for the lucky owner of this spacious vessel. Two toilet rooms complete with showers have private access from all cabins. Yet with all this concern for privacy, there's plenty of room for all to congregate either in the main cabin for dining or conversation, or in the sunny and dry midship cockpit. Please note the special consideration given to both the cook and the navigator, probably the two most important crew members on any voyage. That 14'+ beam has really been put to good use, making the STARPATH 44 an ideal boat for family cruising or charter use. Our STARPATH 44 was designed with performance, safety, and ease of operation paramount. Side decks are a nominal 22" wide with hefty bulwark and inboard shrouds for safe trips forward. All sheets are quickly accessible from the cockpit. The propeller is well protected from damage as is the rudder. Four scuppers assure fast drainage of the cockpit and it's watertight to the rest of the vessel. The efficient sloop or ketch rigs offer a wide array of possible sails, and a double headsail (cutter) rig could be readily adapted. There are two or three locations on deck for carrying a dinghy. The STARPATH 44 is a stiff boat, but with a gentle motion, well suited to passage making. Smooth flowing hull lines not "bent" to conform to racing rules provide easy movement under sail or power. Our STARPATH 44 can be built in "one-off" fiberglass using either PVC foam or C-FLEX fiberglass planking, or in cold-molded wood construction using diagonal layers of plywood or veneers. But that's not all! 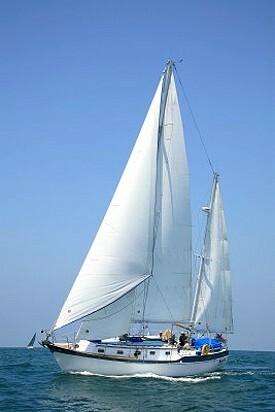 The plans cover a total of four underwater configurations to suit exactly your type of sailing: the performance version with a deep keel and separate skeg/rudder, a shoal draft version with centerboard, offering a separate keel and skeg/rudder, a cruiser version with a long deep keel, and a cruising version with centerboard and shoal draft having a long keel. The choice is up to you. Whichever version you decide, you'll be able to build your own STARPATH 44 for a fraction of the cost of comparable stock boats. Order our Study Plan brochure for more information on this dream boat.